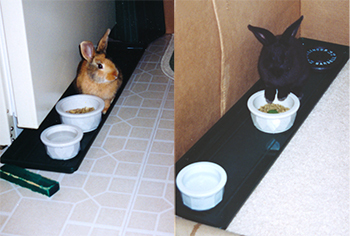 This entry was posted in Bunny Stunts & Fun, Bunnyproofing, Shadow Bunny Rabbit, Tigger Bunny Rabbit and tagged bunny rabbits, furniture, plant trays, plastic trays by Rabbittude. Bookmark the permalink. That was pretty creative repurposing on their part. Tigger and Shadow were something else with how they would think of doing things. 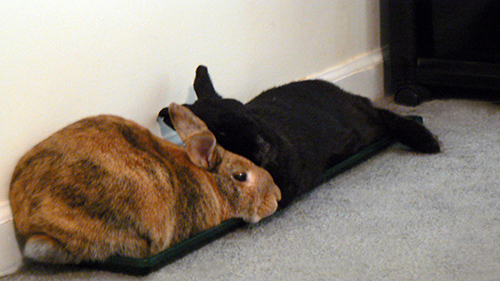 It was a real challenge sometimes to keep ahead of them with bunnyproofing, but this was one of the easy things to just turn the trays over to them open and ready for them to just flop on. Rabbits are really funny, in how they choose what and where to get comfortable. Pikachu has a soft baby blanket to lie down on, however I often catch him lounging on a wooden tray which I repurposed into a toy for him. It was meant to be a toy, but he uses it as a hang-out! It is so weird. We got a couple soft beds for Leo which he absolutely won’t use. He likes bare floor or cardboard boxes. Tigger & Shadow, we tried some of the round fleece cat beds. Tigger liked those, but Shadow just wanted to eat them. Both of them really liked the hard plastic plant trays. With what you are saying with Pikachu, it seems that our rabbits want firm surfaces, not soft.